Visit miele.goodhousekeeping.com and enter the Good Housekeeping Miele Ultimate Laundry Care Sweepstakes by November 12 for your chance to win. One lucky winner will receive a laundry room makeover with Miele appliances worth $4,000. The Good Housekeeping Miele Ultimate Laundry Care Sweepstakes is open to legal residents of the 50 United States and the District of Columbia, who have reached the age of 18 years old in their state or territory of residence at time of entry. Legal residents of Canada (excluding Quebec) who have reached the aforementioned age in their province of residence at time of entry are also eligible to enter. The Sweepstakes begins on October 1, 2018, at 12:01 AM (ET) and ends on November 12, 2018, at 11:59 PM (ET). Limit one (1) entry per person for Sweepstakes. The grand prize consists of one (1) set of two Miele appliances which is one (1) 24 inch W1 Front-load washing machine, and one (1) 24-inch T1 Heat-pump tumble dryer, plus shipping. 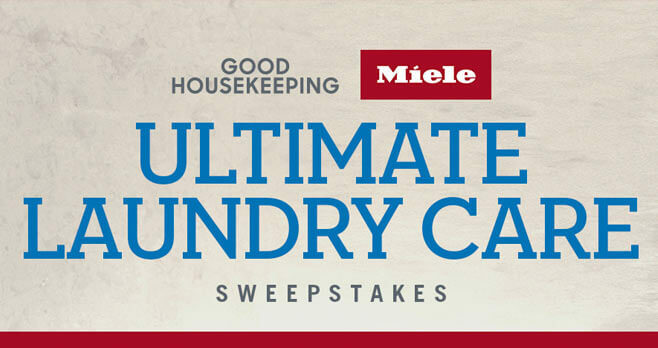 Visit miele.goodhousekeeping.com to enter and see Official Rules for details. I am trying to enter the laundry care sweepstakes and keep getting all kinds of pop-up ads, even when I click on the Sweepstakes entry form. Help! !